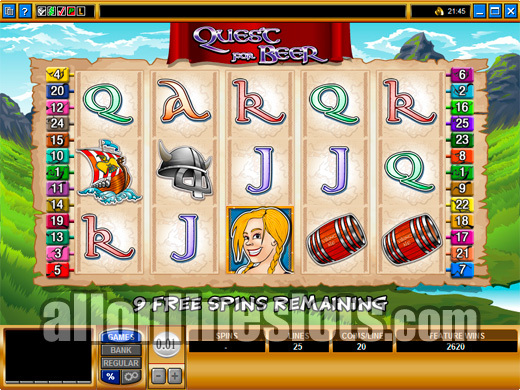 Quest for Beer is a Microgaming video slot wih a drinking theme. It has a top line win of 2,500 coins and you can bet up to 20 coins per line. 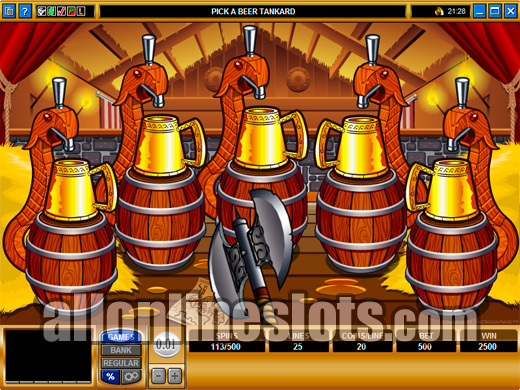 The Beer Tankards and Wenches activate the free spins and the Axe Throw bonus game. 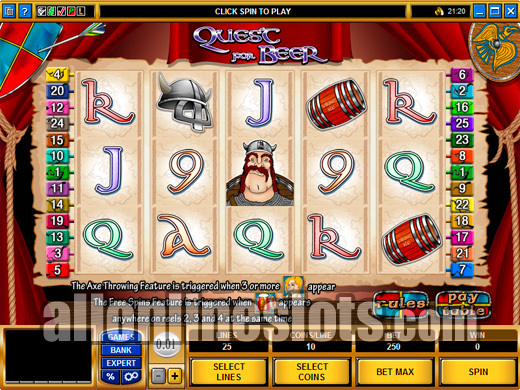 Quest for Beer is a Microgaming powered online slot game with 5 reels and 25 lines. It has a beer theme with an adventure twist. Top jackpot is 2500 coins and you can win free spins or a pick a box style Axe Throwing bonus feature. 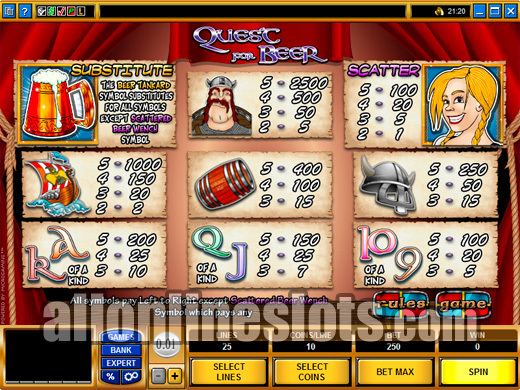 Maximum bet on Quest for Beer is 500 coins (20 Coins Per LIne). Coin sizes start at one cent but even at this level max bet is $5. If you have a small gambling budget then you can get away with just playing one coin per line and not miss out on any of the games features. On the reels you have various beer and adventure related symbols such as wild Beer Tankards, Beer Wenches, Kegs, Ships and Vikings. The wild symbol is the Beer Tankard which only appears on the middle three reels. The Viking symbol awards the top line pay of 2500 coins times your line bet. At max bet the top jackpot pays 50,000 coins (2500 X 20). Second highest pay is 20,000 coins for five ships followed by 8,000 coins for five kegs. Five scattered beer wenches pay 100 times your bet or 50,000 coins at max so there are two ways of hitting the top pay. In addition to being wild the Beer Tankards also start the free spins. Get three anywhere on reels 2, 3 and 4 and you win 10 free games with all wins doubled. If you get the three beer tankards again you can re-trigger the free spins. Top jackpot on the free spins grows to a nice 100,000. The Beer Wenches also activate a bonus game. Get three or more anywhere on the reels and you win a shot at the Axe throwing bonus. Here you move to a second screen feature where you see 5 kegs. You get three axes to throw. Pick a keg and you throw the axe and reveal your prize (Screenshot). The bonus ends when you either use up your three axes or you hit a keg that has no beer in it. All bonus wins are paid as multiples of your triggering bet so the more you bet the bigger the possible rewards on the bonus stage. Quest for Beer also has an Australian style double up option. At the end of any win spin you can choose to try to increase your win by gambling it. You can choose either red or black to double your win or the suits to try to quadruple your win. You can keep going until you reach the gamble limit.